To renovate or tear down? That is the question. After purchasing the property, we had a barn straightener come out to evaluate the structure and give us some advice. His conclusions were mixed. The barn was still salvageable, but was in need of paint, a new roof, a new foundation, and straightening. Because we were short on time (we were moving to Sweden for a two-year expatriate assignment) and money, we decided to have it painted and the windows replaced to preserve it for a later decision. We returned to the farm from our expatriate assignment in the summer of 2003. Our friendly old barn stood there waiting for us and for our decision on her fate. 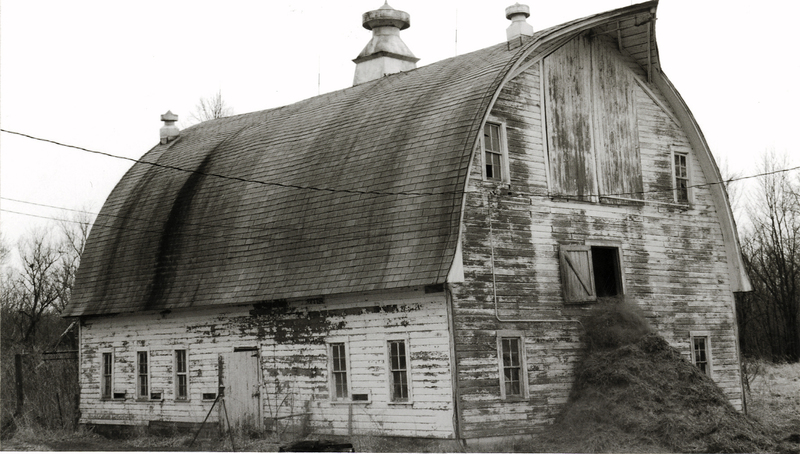 Facing the reality of the money necessary to completely restore the barn was discouraging and seemed like a poor investment. 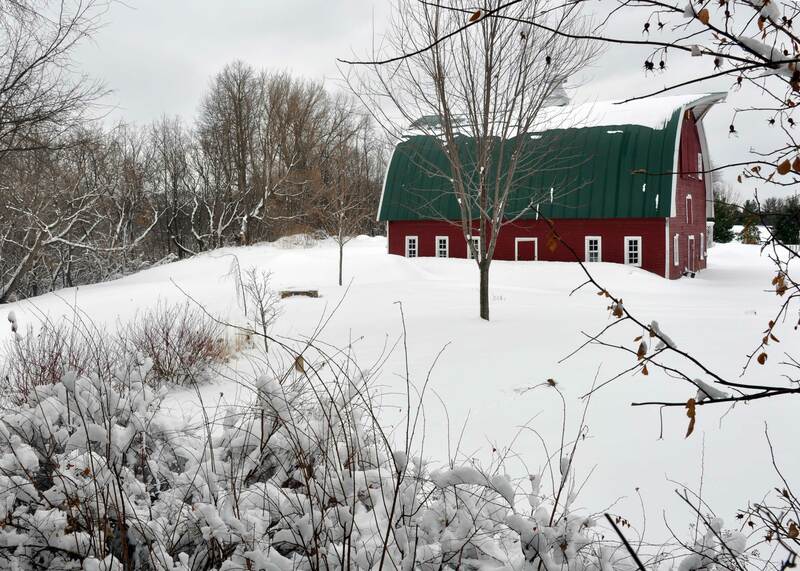 On the other hand, the barn is what gave our little farm its character. Being two farm kids, it’s what drew us to this place from the beginning. We discussed having it burned down at some point by the local fire department, but our soft spot for this structure just kept us putting off any final decision. In the spring of last year, we experienced a nasty day with high winds gusting in from the south. 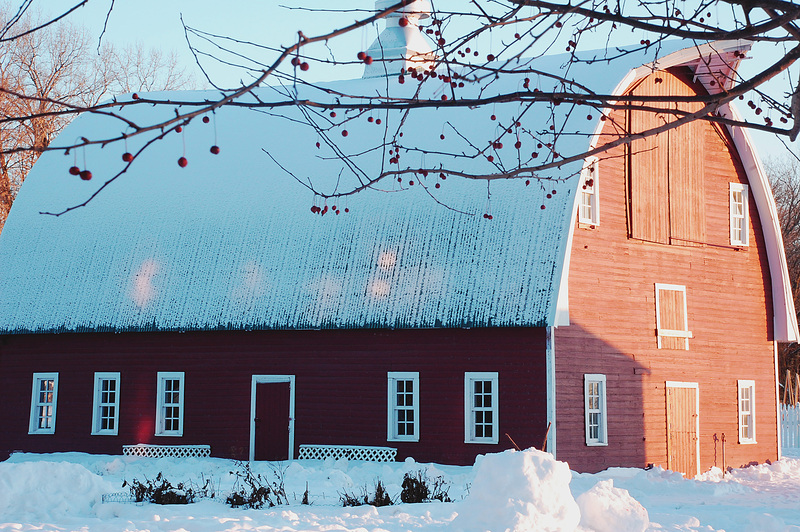 As I stood inside looking out the kitchen window, I could see shingles flying over the barn after peeling off the southern-facing roof. 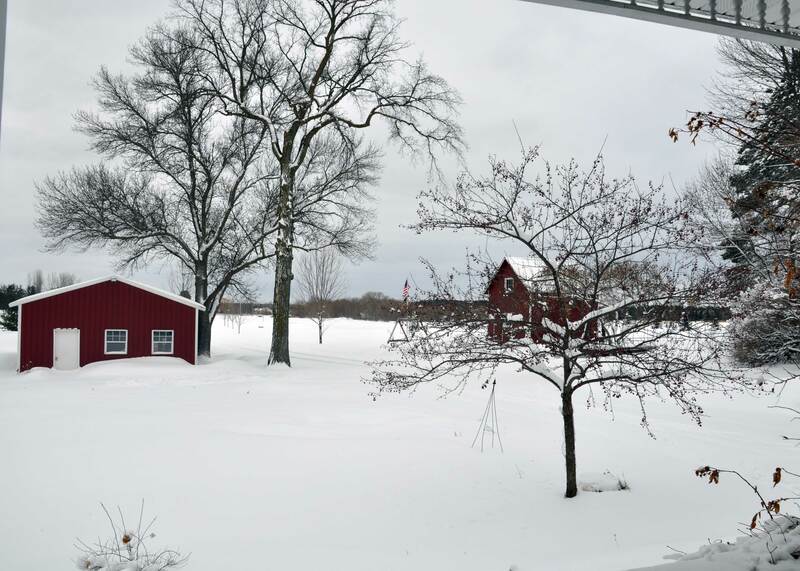 With the yard littered with old asphalt shingles, I knew that a decision would soon be necessary about the fate of the barn. 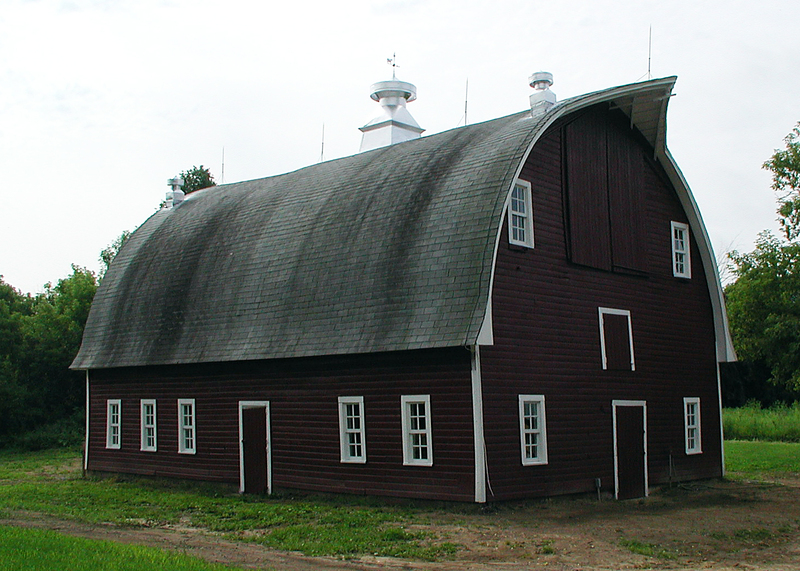 The barn’s deterioration would now be quickened with the more seriously compromised roof. After some inquiry to the insurance company, we realized that we would have some coverage for the damage caused by the wind storm to the roof. We started gathering information and quotes on the costs of repairing the roof. 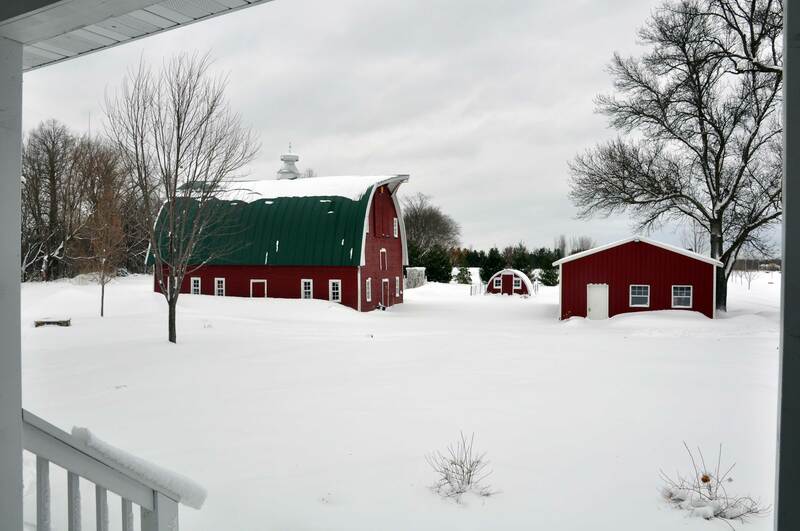 Although not the most visually appealing alternative, we concluded that the most economical approach would be to have a new steel roof put on the barn. 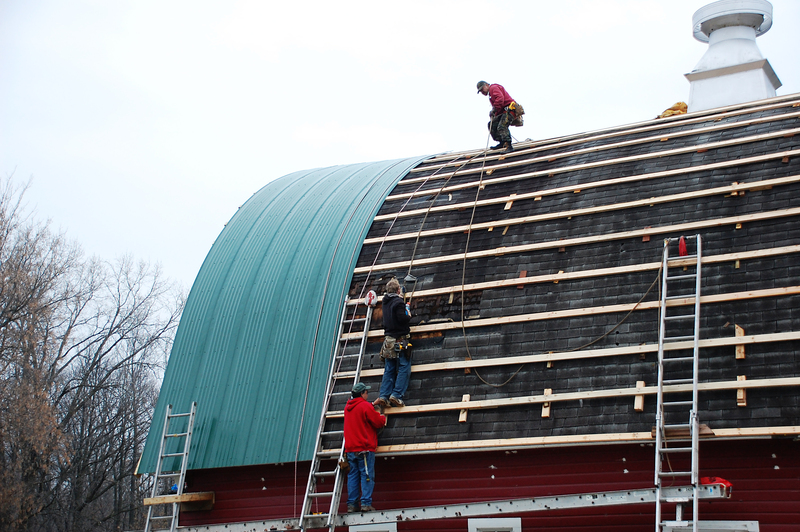 Prior to having the new roof installed, we hired the barn straightener to shore up the barn structurally. The process took about two weeks. He moved it gradually over the two weeks by bracing, pulling, and cranking it back to an upright position. New lumber was installed inside to strengthen the structure further and hold it in its new “straight” position. 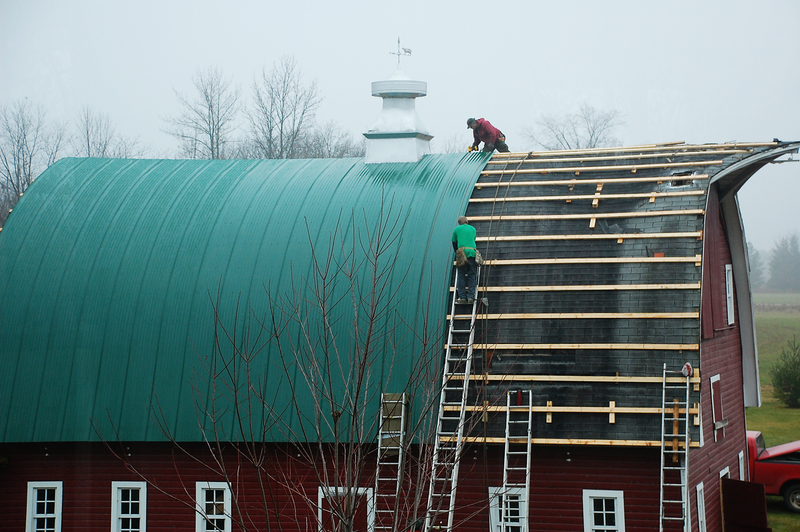 Finally sitting straight and tall, the barn was ready for its new roof. The first step in installing the new steel roof was to put cribbing across the old roof to level everything out. The cribbing is an efficient way to quickly cover the many sags in the roof. 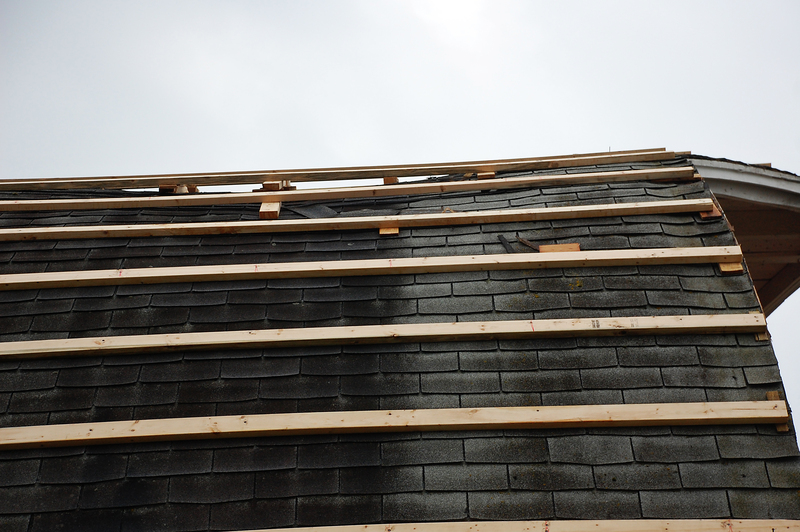 The whole roof was eventually covered in the cribbing. 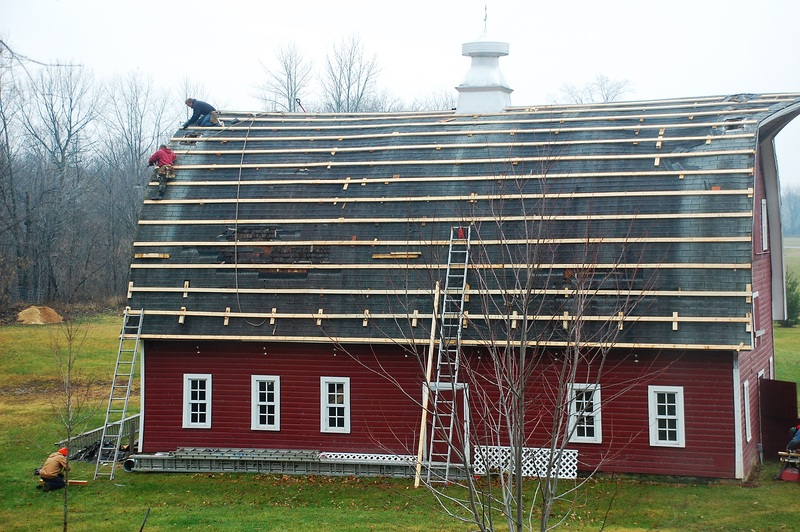 The roofers then began installing one sheet of metal roofing at a time. Brave, brave men. Until they finished the entire roof. Our old barn now stands straight and tall with a new roof, waiting for us to find the time and money to take the next steps. It might take many years to make any more progress, but at least our decision has finally been made. 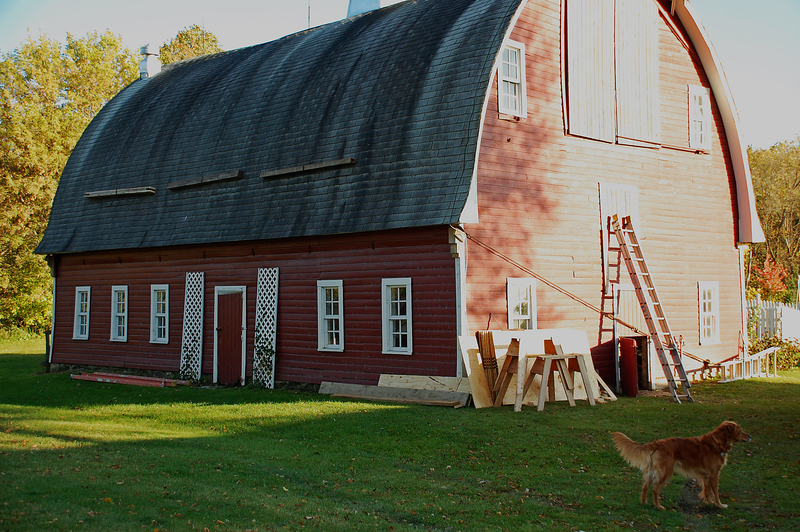 We will keep the old round top barn that we fell in love with a decade ago. As a farm kid, I grew up with a smokehouse right outside the house in the front yard. It was a small brick structure without any door. My parents called it a smokehouse, but it was never used to smoke anything. 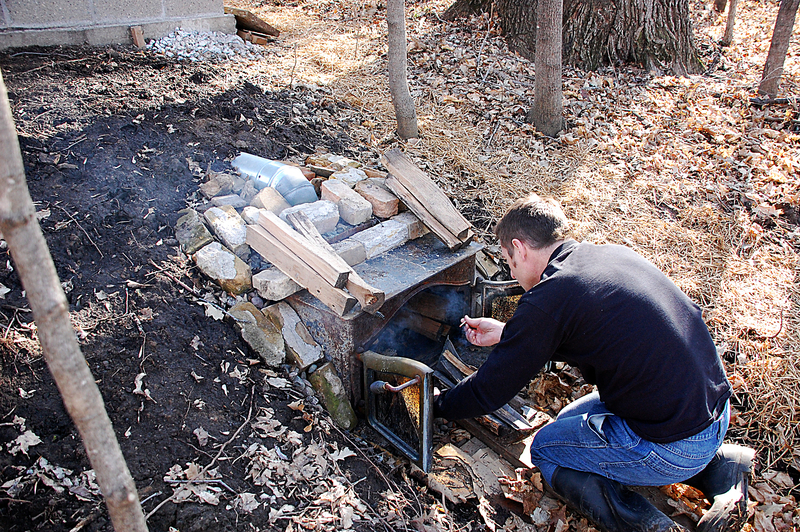 The sole purpose of the “smokehouse” was to burn things…garbage, boxes, etc. Eventually they removed the smokehouse from the front yard to construct a fence. Jesse started talking about building a smokehouse soon after we bought the farm. He finally turned his vision into a reality last summer. After a lot of research and sketches, he came up with a design. Jesse already had a barrel smoker for hot-smoking or cook-smoking, but what he really wanted was a cold-smoker to be able to smoke pork sausage in the tradition that his grandfather used to do on the farm. There are also several other cold smoke products that are absolutely delicious: salmon, hams, cheese, nuts, and various sausages. The art of cold-smoking is to keep the meat or fish below 70 degrees F to inhibit bacteria growth and to not cook the meat product. For instance, if you would like smoked venison sausage, but don’t want to eat the complete deer all at once (who would….? ), then cold-smoking will impart the desired smoke flavor and will also retain the fat inside the sausage so that it doesn’t become dry and hard. Toss cold-smoked venison sausage into the freezer until you are ready to cook it for another tasty meal. Another example that we have become very fond of is cold-smoking 5 to 10 racks of baby back pork ribs, wrapping them in freezer paper and tossing them into the freezer. Take them out of the freezer later and bake them in the oven for a couple of hours and you have some of the best ribs ever! 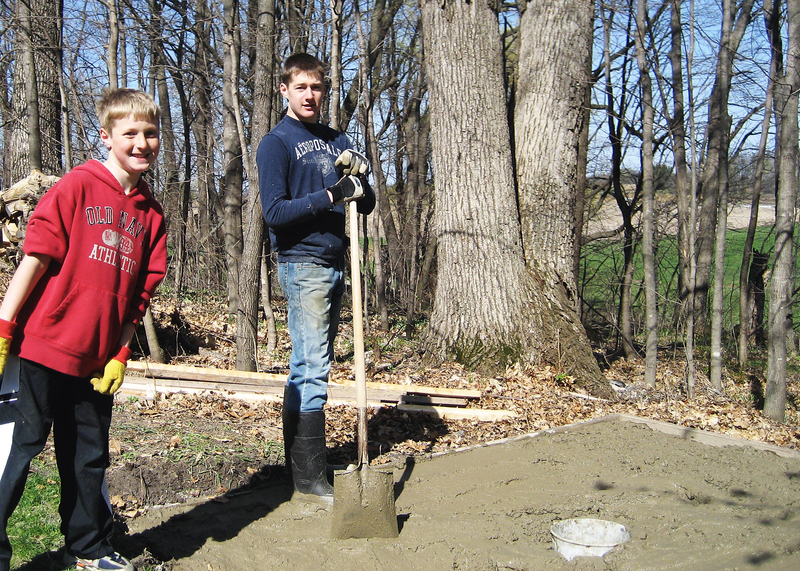 The concrete slab was poured in the spring. Our boys learned about mixing, pouring, and finishing cement. The 5 gallon bucket in the middle of the slab is where the smoke will enter the smokehouse. The slab is what is called a “floating” slab. There is no frost footings below the slab, it is simply framed to have a 10 x 10 inch “curb” around the outside of the slab and the rest of the slab is 4 inches thick. There is also reinforcing rebar in the curb and criss-crossed across the slab. I don’t think it is going anywhere, and after one winter of freezing and thawing, there are no signs of cracking or shifting. 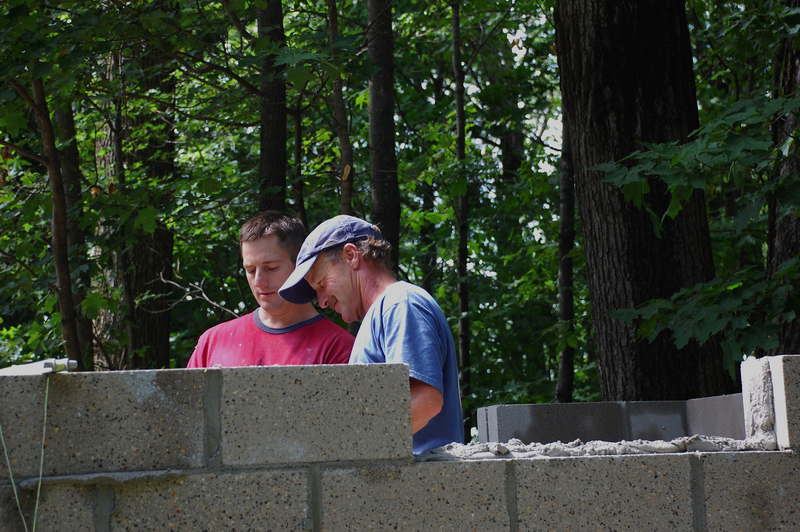 Jesse’s uncle, a mason by profession, came over to help in building the smokehouse. His skills amazed us as he tossed just the right amount of the mud in just the right place. Jesse did a great job supervising…. Jesse designed the smokehouse to have glass block windows to allow in natural light. Laying the glass block was the most time-consuming part of the block laying process and the expertise of Jesse’s uncle was definitely necessary to get the glass blocks set just right. Our son worked on smoothing the joints between the blocks. 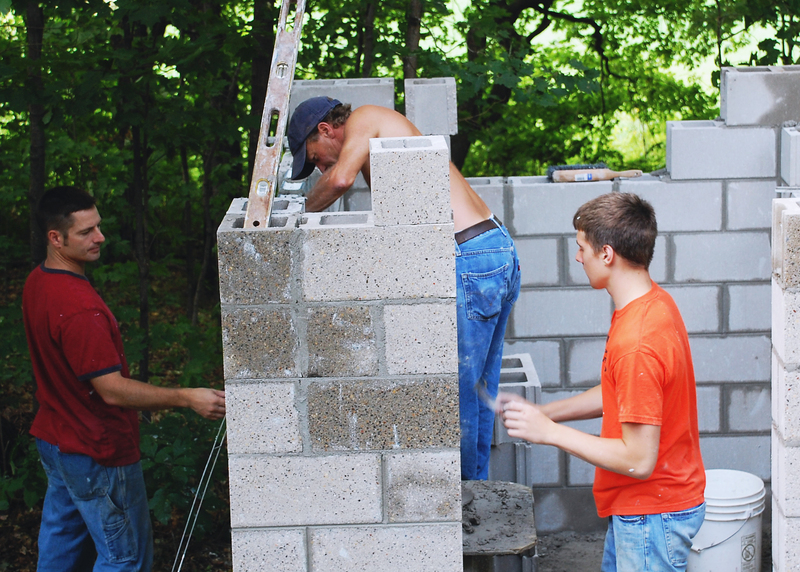 After the blocks were cured, Jesse and our son went to work building roof trusses, sheeting the roof, and laying shingles. Jesse decided to build the trusses so that the rafters could be used for hanging meat, so they are about 6 ft. high. There are vents covered with window screen in the peak at each end of the smokehouse for draft. Jesse had built elaborate hinged doors for adjusting the draft level if needed. However, the correct draft position turned out to be full open. The firebox for a cold smokehouse is located away from the smokehouse to allow the smoke to cool before entering the smokehouse. The smoke from our firebox increases the temperature in the smokehouse a mere 5 to 10 deg F. This allows Jesse to safely cold smoke on days as warm as 60 degrees, but he prefers to have the outside temperature around 30 – 40 degrees. 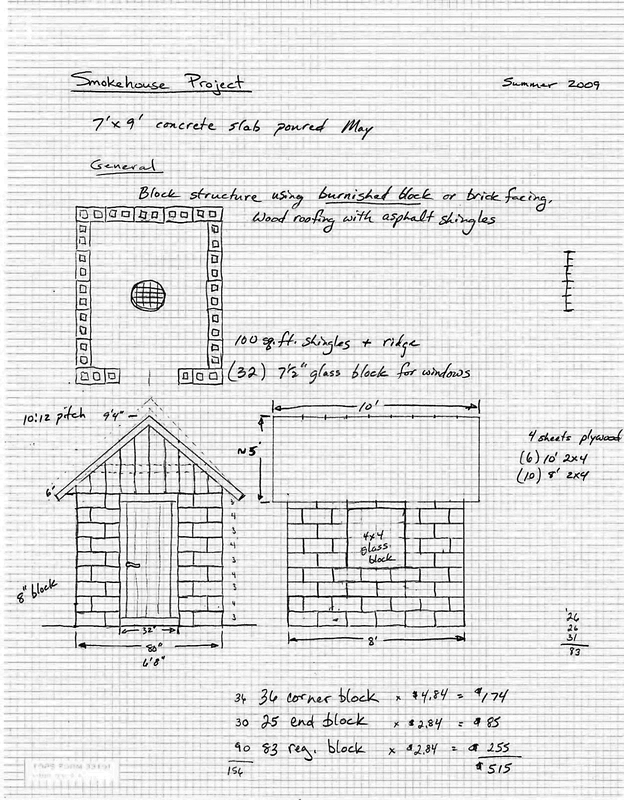 The tricky part for the firebox is that in order to have adequate draft for the smoke to enter the smokehouse, the firebox should be located about 10 – 12 inches below the smokehouse floor and 8 – 10 feet from the center hole in the smokehouse. So the only logical way to build this operation is to locate the smokehouse on a hill or slope with enough fall to allow access to the firebox. 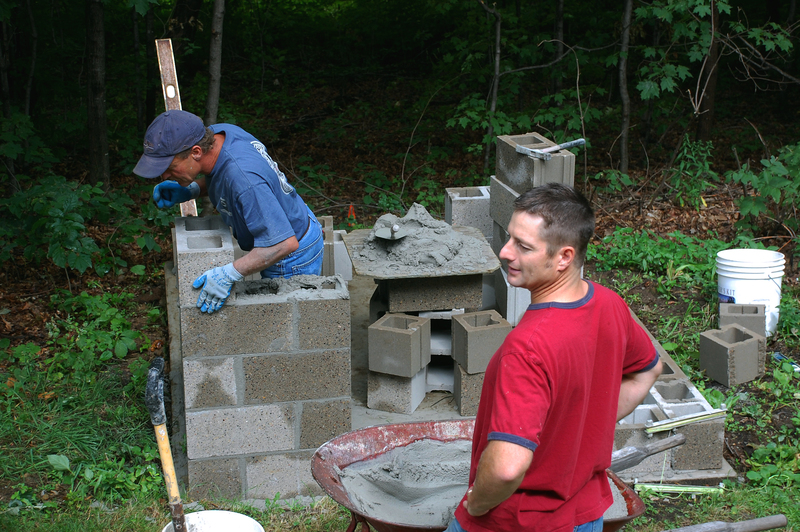 The firebox can be made from concrete and firebrick with a sliding steel door, but Jesse chose to use an actual home fireplace insert that someone had discarded into a road ditch. With the air intake vent controls on the fireplace he figured that he could control the fire for smoking to just the right levels (and it works perfect). He dug a hole into the side of the hill for the fireplace, and left enough room for about 2 – 3 inches of sewer rock around the fireplace to assist in water drainage around the fireplace. With the heavy gauge steel, the fireplace insert should last longer than our lifetime before it rusts out (it weighed about 5oo lbs. and had to be moved into place by a tractor). Jesse used 8 inch chimney pipe to connect the firebox to the 5 gallon bucket in the floor of the smokehouse. Obviously you want to install the pipe before you pour the concrete floor. The reason he chose the 8 inch metal chimney pipe was that the firebox had an 8 inch exit, and he needed something that would withstand the heat near the firebox. 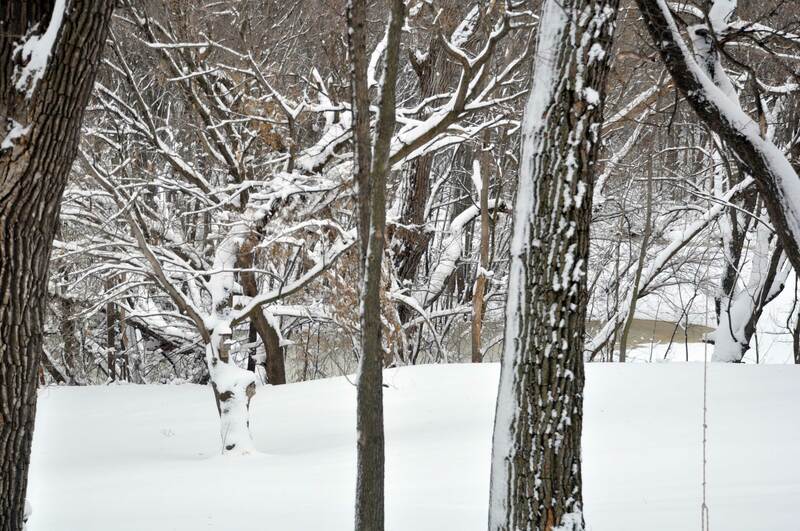 He says that he would NOT recommend using PVC or other plastic pipe as it may melt or out-gas if heated. 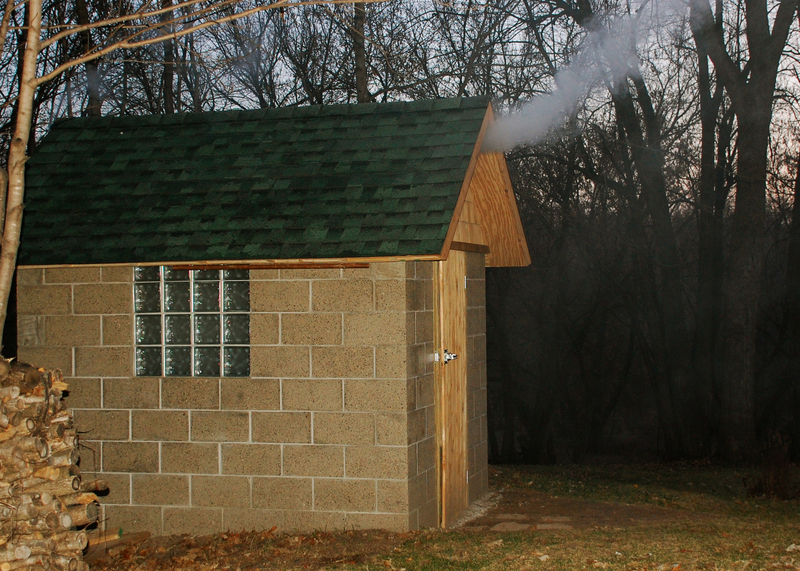 And here is our lovely little smokehouse in action…..
Maybe a bit over-sized for your casual home smoking, but it works GREAT!